The Tyler Hitchcock Agency announces a new charity campaign in Grand Prairie, TX, to support the needs of a young family devastated by sudden loss and overwhelmed with expenses. Lulu Arellano, 19, died in a tragic car accident last month, leaving behind her husband, Devin Macias, also 19, and their little boy to cope with life on their own. 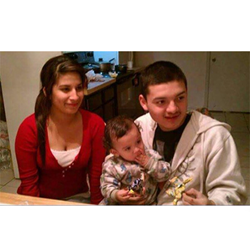 Our hearts are breaking for this widowed young father and his son. Helping them is a perfect fit for our new community enrichment program, which we formed to help unify community support for neighbors in times of crisis. The Tyler Hitchcock Agency has unveiled a new charity campaign in their ongoing community enrichment program serving the families of Grand Prairie, TX. Young Lulu Arellano, just 19, died in a tragic car accident last month, leaving her husband, Devin Macias, and their little boy to cope with her loss alone. Understandably, Devin is overwhelmed by hospital bills, funeral expenses and everyday living expenses. Community members who wish to help may contribute their support here: https://www.gofundme.com/luluarellano. Lourdes ‘Lulu’ Arellano was a hard-working, devoted wife and mother at just 19 years of age. She and her husband, Devin Macias, also 19, had known each other all their lives when they fell in love six years ago. Their son Revin was born a year later. On the morning of January 23, 2016, Lulu was in a terrible car accident and spent three days in the hospital on life support before succumbing to her injuries. Her devastated young husband and son are struggling not only with the loss of a loving wife and mother, but also with staggering hospital bills and funeral expenses. Everyday living expenses will continue to be a challenge, as Lulu’s job was essential to meeting their responsibilities. Devin is deeply grateful for any help the compassionate community can provide. Supporting their latest Community Cause has never been easier, as The Tyler Hitchcock Agency has pledged to donate $20 to Devin Macias for each and every referral they receive for an insurance quote, with no purchase necessary. Readers who would like to view the campaign, refer a friend or make a personal donation may do so here: http://www.tylerhitchcockagency.com/Our-Hometown-Magazine_46. Utilizing its own resources and seeking the help of its vast network of customers and business partners, The Tyler Hitchcock Agency marches on to ensure customers, friends, family and neighbors are always in good hands. The agency recently launched their master charity program, promising to choose a new local organization, family or individual every two months to receive support. To learn about past campaigns, please visit: http://www.tylerhitchcockagency.com/community-cause. Further information about The Tyler Hitchcock Agency is available at: http://www.tylerhitchcockagency.com/. Serving the families of the Fort Worth-Arlington-Dallas metro area from offices in Grand Prairie, TX, The Tyler Hitchcock Agency is committed to bringing local people an agency which understands their needs. Tyler Hitchcock and his team of dedicated professionals work with carriers to assemble a variety of products and services which will ensure their clients’ peace of mind. From all of the products a typical consumer needs (home, auto, boat, ATV, etc. ), to financial planning services, The Tyler Hitchcock Agency delivers consistently superior service. The caring experts at The Tyler Hitchcock Agency may be reached by calling 972-642-0798.